Our two new Premier 1,535 gallon cisterns are installed and ready for a rain dance. The 200 square foot shed roof will channel enough water into those tanks to sustain three times the vegetation that we currently water. 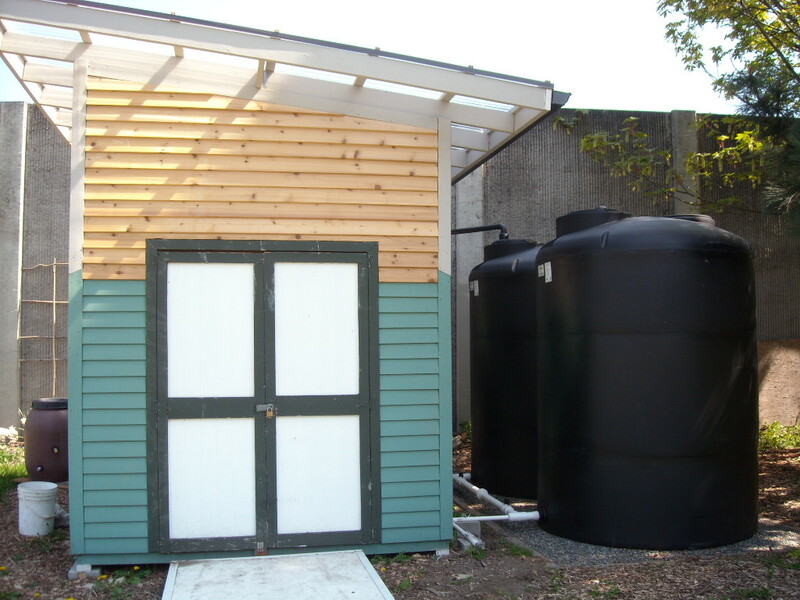 Once we chose the cistern size, the design of the shed rebuild followed. The entire shed rebuild was based on the bottom of the gutter on the low side of the roof being 9′ 6″ from the ground. That requirement, and the choice of a 1.5′ rise per 12′ roof run, drove all other dimensions. Seattle averages 36 inches of rain, 75% of which falls between the six-month period October through March. Our roof is about 200 square feet. Since an inch of rain will produce .6234 gallons of water over a one square foot area, our cisterns can catch 4,000 gallons during a normal year. Last summer, we brought in 1,200 gallons of water from outside to water the plants, mostly fruit and nut trees, berries, and kiwi vines. However, the community-adopted orchard plan includes water intensive vegetable gardens. We needed more water. How much water will a vegetable garden plot need? 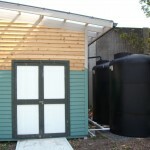 One website – http://www.urbanfarmonline.com/urban-gardening/backyard-gardening/watering-timers.aspx – suggests that a 10 ‘ x 10’ vegetable plot needs 100 gallons per week for the 12 dry weeks of summer – a total of 1,200 gallons. A new fruit tree, on the other hand, would need five gallons per week during our dry summer, or just 60 gallons. 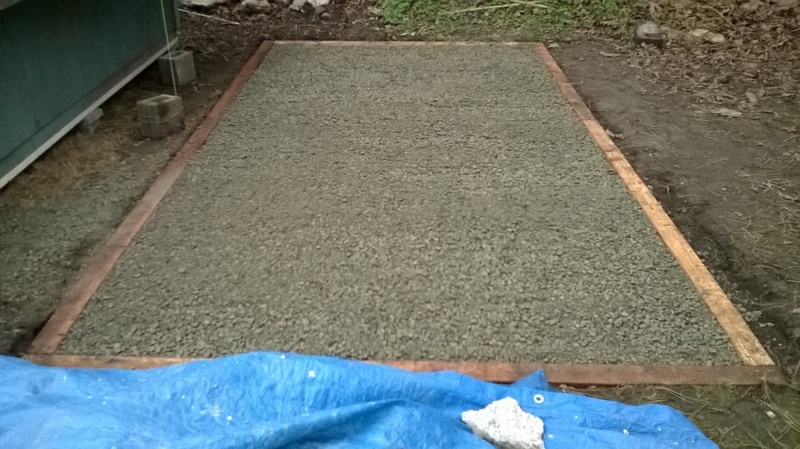 The first phase of cistern installation involved building a solid level pad. 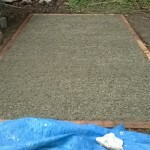 Our pad is flush with the ground and has a 4″x4″ cedar frame filled with an inch of sand and three inches of 5/8 minus gravel. Jennifer K put together a nice leveling mechanism and many volunteers dug out the earth in just a few hours. 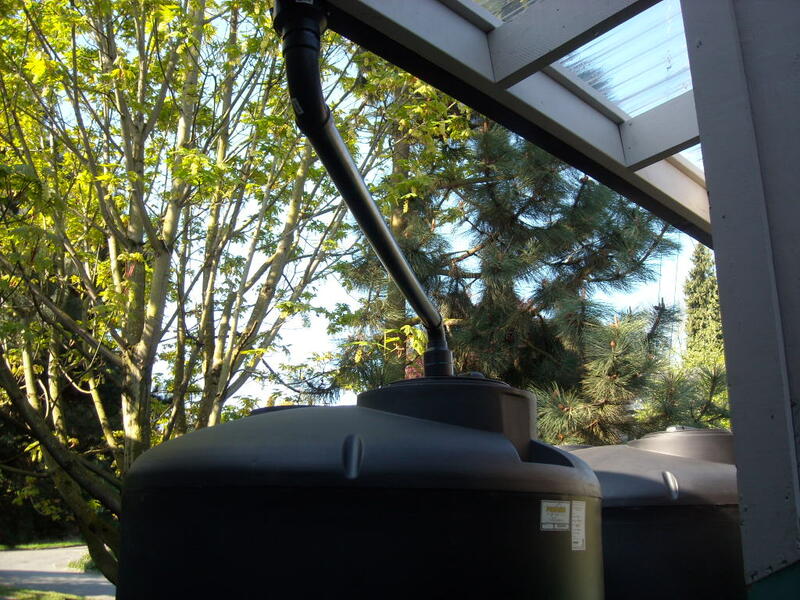 After the shed was built and the pad in place, we waited for Patrick from Earth Systems Northwest to deliver and install the sistered cisterns. Patrick added the plumbing, spigots and the overflow pipe in less than a day. Filling those cisterns will be sufficient to water our existing plants, allow us to add a few new fruit trees and water a couple of garden plots. A couple of garden plots? We need to offer more than that to help meet the increasing demand for gardening space. And we will! City water service is stubbed in. With the cisterns to meet much of our needs and City water as a back up, the orchard will be lush in a few years. 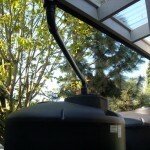 This entry was posted in Construction, Plants, Uncategorized and tagged Cistern, Vegetable, water on April 18, 2015 by Ruth.